Programmable motor for stretching/retracting a mounted muscle 10 μm up to 11 mm. Simultaneously examine up to four muscle strips under isometric conditions. The MyoDynamics Muscle Strip Myograph System - 840MD represents a state-of-the-art 4-channel myograph system for muscle strips of up to 30 mm in length. The system was originally developed to give the skeletal muscle physiologist a precise, easy-to-use, high-throughput muscle myograph with the capacity to stretch and retract the muscle under a range of conditions including electric field stimulation. The special design of the chamber, however, gives this system the flexibility to mount larger muscle strips of various organs and striated muscle up to 30mm. Each muscle bath unit, made of aluminium, features a stainless steel chamber. The tissue supports are positioned in the chamber with one side attached to the force transducer and the other to a combination manual positioner screw and a motorized micro positioner. The manual positioner allows the accurate setting of preload while the motorized micro positioner permits the user to stretch/relax the muscle according to user-defined settings. The sensitive force transducers provide measurement of isometric muscle contractions. Mounted tissue can be stretched and relaxed defined by the user with a minimum distance of 10µm up to 11mm and a maximum speed of 11mm/sec. ​See also the MyoDynamics Muscle Strip Myograph System - 820MD. 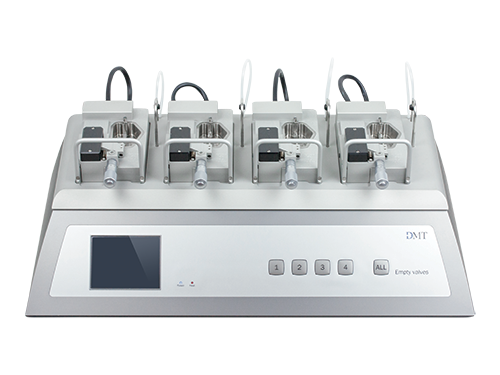 A state-of-the-art 4-channel Myograph System for muscle strips of up to 19 mm in length. The MyoDynamics Muscle Strip Myograph System 840MD comes with a unique tissue clamp system and hooks to hold the mounted tissues. Customized mounting supports can be made upon request. This myograph is well suited for studies involving muscle reactivity and fatigue experiment in connection to neuromuscular disorders such as muscular dystrophy, ataxia and myofibrillar myopathies.